Groupon Taiwan has revealed that it has been the victim of a hack which saw usernames and passwords belonging to its 4.1 million registered users compromised. On the positive side, the intruders did not access credit cards and financial details, the company said. As Inside Taiwan reports [Chinese], the attack on the service — which is Taiwan’s biggest group-buying site — took place last week. The company has sent password reset prompts to all users compromised, but it is not revealing exactly how many were affected. A note on the company’s website went up this week explaining that all passwords were encrypted and, in addition to credit cards numbers, other personal data, including such as addresses, telephone numbers and full names, was not accessed. 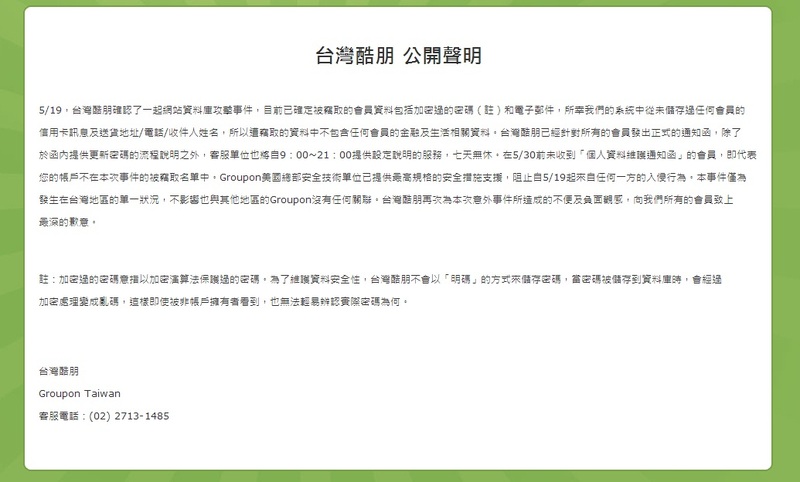 It further explains that the data breach affects Groupon’s business and customers in Taiwan only. Groupon Taiwan says it has more than 4.1 million ‘regular’ customers, with 200,000 people subscribed to its email newsletter. Groupon bought its way into Taiwan when it acquired local service Atlaspost in December 2010.